My knitting time has taken a serious face-plant lately. Summer vacation having eliminated most of the time I sit around waiting for Denizens here, there and everywhere, I’m trying to grab moments where I can. And then I started working again. Hello, no-time-at-all-for-anything! 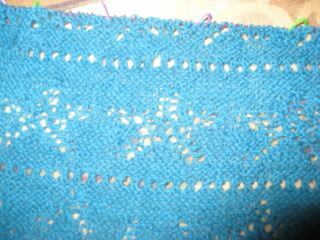 It’s actually starting to look like a shawl now. This being a pattern that starts with the whacking-huge 1,672,170 cast-on stitches, it gets faster and faster as you go – a definite plus for me right now. The first bunch of rows took a good half hour or forty-five minutes to do, and now I’m getting through a row in about fifteen minutes, give or take depending on how many yo-ssk-blah-blah-blah they put me through. This shawl is heading to the prayer shawl ministry when it’s done. It’s been causing a bit of a mix-up in the group (bwa-hahahaha). We’ve all settled into a rut, all doing the same thing again and again and again: *Pick a bulky acrylic yarn, grab huge needles, cast on a bunch of stitches, knit a rectangle or triangle, repeat from *. As I was digging through looking for another bulky yarn for another triangle, it suddenly hit me: Why? Why is it that my “fiddly” knitting, my “cool” knitting, my “fun” knitting, was reserved only for, you know, family? What’s wrong with doing something, you know, interesting, for others? Maybe a little more intricate, a little lacier, a little more feminine, a little more delicate? Especially when we’re talking about this group, where there are no ‘acrylic only’ or ‘machine wash only’ restrictions? These shawls are given to people on a very personal, one-on-one basis, with full ability to make sure the receiver isn’t allergic to wool or hand-washing something. Why not do something other than the bulky-yarn-triangle? So I started bringing this to the meetings. And now one of the other members is doing a box-lace lap blanket in a worsted weight. Because she suddenly thought, Hey! I can do that kind of stuff! Why don’t I do that kind of stuff?! The virus has been spread. 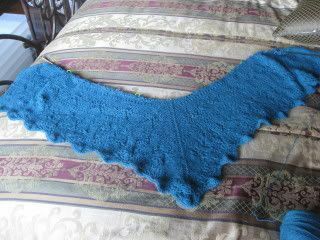 So, do you wonder who will need a prayer shawl that speaks of the ocean? I believe God nudges us with inspiration. It will be interesting to read the final chapter of this shawl. Just for the record, there isn't a snowball's chance in hell that I could get from one end of a row that long to the other witout dropping 10 stiches and picking up 12. Seriously. Never going to happen. The high school seniors werre in charge of the service that day. One spoke of the charity clothing donations she planned to give, culling the undesireables from her wardrobe to pass on...when she paused and thought, "I bet they'd like a pair of my designer jeans, the nice ones, not the cheapy dork ones I got just to donate..."
Yes, they deserve the nice stuff, not the left-overs, the practice try-outs, or the not-quite-nice-enough-to-keep items. Thanks for the reminder. It's a good gift.